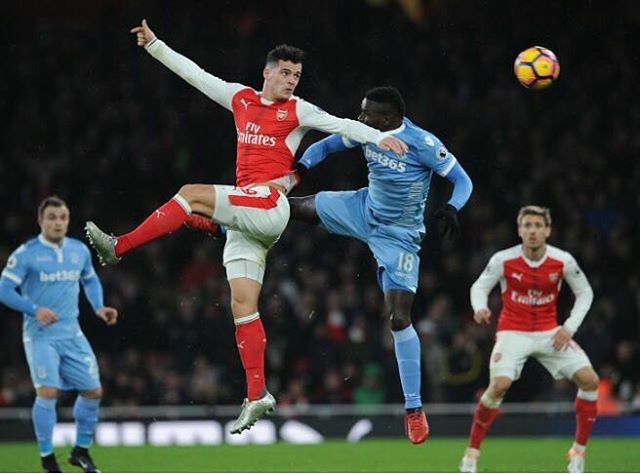 Granit Xhaka has followed the footsteps of some of his teammates by posting an update on social media in a bid to celebrate their win on Saturday. Arsenal beat Stoke City 3-1 at the Emirates Stadium on Saturday and became league leaders for many hours before Chelsea's 1-0 win over Westbromwich Albion. The Gunners conceded first against Stoke and it was Xhaka who caused it all by conceding an avoidable penalty. Xhaka has now taken to Twitter to reveal the joy in him after helping his side to victory despite a very silly mistake he made. He failed to talk about the penalty though. While he has received enough praise for his outstanding performance since joining Arsenal from Borussia Monchengladbach last summer, he has also been called to question for his temperament issues which have seen him disciplined on many occasions.